We expect our new, larger stove to be available in the first quarter of 2011. We're not taking orders yet, but........ We do know it will have a 6 inch convertible flue collar (top vent or rear vent). 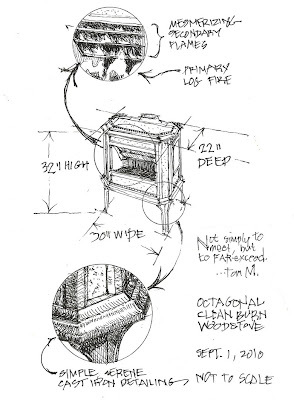 Our early design, seen below, was created by Vance Smith. Vance and Al Wilker designed all of our gas stoves, as well as many stoves produced by other manufacturers, including Vermont Castings. Just as our gas stoves are updated versions of the original Franklin stoves, our new wood stove will be an updated version of our Fireview.